Incorporating a space just for kids keeps them close-by during meal prep. Design by Principal Designer Anne De Wolf, photo by Patrick Weishampel. In preparation for our Spring workshop we will share a few posts on kid-friendly spaces. First up: kitchens. Here are a few things to keep in mind when designing your kid-friendly kitchen. Caesarstone is a durable & kid-friendly countertop. Design by Principal Designer Anne De Wolf, photo by Photo Art Portraits. The largest, most used areas of your kitchen are counters, floors, cabinets and appliances – choose finishes that are durable and easy to clean. Your most durable countertop options are Quartz, Corian and Swanstone. They require little maintenance and largely resistant to staining, scratches and heat. Granite is another good option – when sealed properly your counters can be non-porous as well as heat-resistant. Hardwood floors are warm and easy to maintain. Design by Senior Designer Kristyn Bester, photo by Photo Art Portraits. When it comes to flooring options, selecting a hardwood or durable large-format ceramic/porcelain tile will serve you well. A wood floor is warm, can be refinished and is somewhat impact-resistant. Spills are easy to clean on a tile floor and typically won’t cause damage if left for a longer period of time. Stainless steel appliances make the space shine. Design by Senior Designer Chelly Wentworth, photo by Photo Art Portraits. Appliances take up a large amount of surface space in your kitchen, so consider the finish you select. Stainless steel looks great but will show hand prints and smudges. There are a few stainless steel finish options that resist marks more than others – Frigidaire’s “Smudge Proof” for example. You could also invest in a good cleaning product that will make removing smudges effortless. 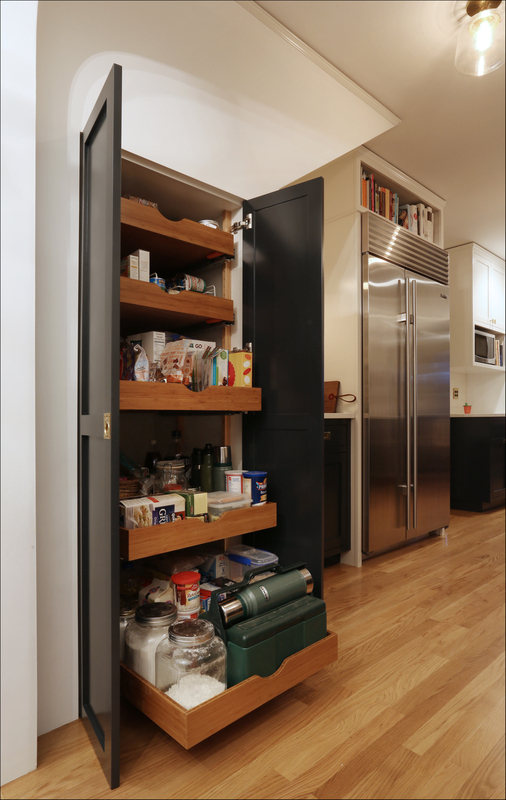 Pullout drawers allow for easy access to all of your pantry items. Design by Senior Designer Kristyn Bester, photo by Photo Art Portraits. Having a pantry that is kid-accessible will make it easier for your little ones to be self-sufficient and will provide ample storage. By adding pullout drawers, everything will be at eye-level. This open-plan kitchen is not only great for entertaining, it keeps your family close by as well. Design by Principal Designer Anne De Wolf, photo by Photo Art Portraits. Create an open-plan kitchen to encourage your children to do their homework nearby while you cook or help out in the kitchen during meal prep. By incorporating an eating space at an island or nearby nook, the kids can be nearby during snack times. A nook off the kitchen is a great place for family meals or games – don’t forget to incorporate a place for your furry friend! Design by Principal Designer Anne De Wolf, photo by Photo Art Portraits. Nooks serve well as a family eating space or spot for homework, games or crafts. Think about incorporating a space for your furry friends too that will keep them close but not too close during meals. A large island is a great place for snack time and for kids to do homework or crafts. Design by Senior Designer Kristyn Bester, photo by Photo Art Portraits. If you spend a lot of time in your kitchen and like to involve your kids, think about lowering the island countertop to make it kid-accessible. Islands also serve as a great place for eating/snack time, homework, crafts and games. If you are pinched for space, rolling carts can serve as islands that easily stow out of the way. Consider collapsible or retractable counters – these are perfect for snack areas or work stations. Microwave drawers in the island allow kids to heat up their own snacks. Design by Senior Designer Chelly Wentworth, photo by Photo Art Portraits. Refrigerator and microwave drawers can be placed below countertop level which gives kids easy access. Refrigerator drawers are a great place to keep healthy snacks and drinks. A designated drawer for pet food keeps it out of the way but easily accessible. Design by Principal Designer Anne De Wolf, photo by Patrick Weishampel. Are your pets your babies? Consider built-in storage for food and water bowls and other fun ways to incorporate them into your space. These are just a few considerations when designing a kid-friendly space. Ready to learn more? Join us on May 18th for our Designed for Your Growing Family Workshop – find the details and RSVP here. Now that you have completed your upper floor renovations you are ready to tackle the basement and some exterior finishing touches. You should have already addressed any water management, seismic or hvac updates, allowing you to focus your energy on the creation of living space that will make good use of your basement real estate. This daylight basement, designed by Arciform Principal Designer Anne De Wolf with interior styling by Shannon Quimby, serves a dual purpose as the family’s media room and a swanky space for entertaining. Who will be the primary users of this space? Which activities will the space be used for? This will affect your design and budget in a variety of ways. For example, those polished concrete floors (shown above) make a sophisticated statement as a party room or home office but may be a challenge for small children. This basement renovation by Arciform Senior Designer Kristyn Bester builds convenient bike racks along with essential storage tucked behind lockers and in under-stair niches. Photo by Photo Art Portraits. On the other hand, your mother-in-law may not value easy access to bike storage, but your teenagers certainly will. Does the space have enough ceiling height to meet code as a finished space? Which modifications (if any) need to be made to the interior or exterior stairs to accommodate your plan? How will you provide code-required emergency egress? How will you provide access to mechanical systems (like furnaces and electric panels)? Where will you put everything that used to be in the basement (including laundry facilities)? For this daylight basement remodel designed by Arciform Senior Designer Kristyn Bester, a new staircase was installed with custom millwork. Dead space under the stairs was transformed into an adorable little playspace for their daughter. Photo by Photo Art Portraits. Unless your stairs are unsafe or placed in a location that is unworkable with your proposed design, we will often recommend leaving the existing stairs in place, since existing stairs are often “grandfathered in” and will not need to comply with current code. For this project designed by Arciform Senior Designer Kristyn Bester, we spiffed-up the existing stairs with carpet, paint and updated millwork. Photo by Photo Art Portraits. For this basement designed by Arciform Principal Designer Anne De Wolf, a stacking washer and dryer were tucked behind a barn door in the bathroom, retaining the room’s original use. Photo by Photo Art Portraits. You’ll also want to consider egress. If there will be a bedroom in your basement, it will need to have a window that fits specific criteria designed to allow for escape in case of fire or emergency. There are other options for meeting egress requirements depending on the location of your doors and stairs. Your design team will help you identify the most cost-effective solution that fits your design goals. A peaceful Buddha peeks in through the egress window in this this basement renovation by Arciform Principal Designer Anne De Wolf, setting a serene tone for the room. Next you’ll want to consider which level of finish your rooms require. This can range from fully-carpeted rooms with a finished ceiling to a more industrial look with polished concrete and exposed ducting. By spraying the ceiling a dark color and sealing the concrete floor, Arciform designer Kristyn Bester was able to give this basement family room a polished look at lower cost. Photo by Photo Art Portraits. At the other end of the spectrum, carpeting and a dropped ceiling with integrated can lights give this basement designed by Arciform Principal Designer Anne De Wolf a finished and family-friendly feel. Photo by Photo Art Portraits. Once your interior renovations are complete, you are ready to tackle some of the finishing touches to your exterior that are best-saved for last. Any mechanical upgrades to your home or additions can lead to your existing roof getting pierced in multiple places to allow for venting and other components to be installed. If you are contemplating a whole roof replacement, wait until your interior projects are complete. The intricate paint job on this “painted lady” Victorian would have been easily damaged by workmen and equipment going in and out of the home as the interior projects were completed. Project designed by Arciform Principal Designer Anne De Wolf. Photo by Photo Art Portraits. Painting the exterior of your home before your interior renovations are complete is a bit like putting your makeup on before you finish getting dressed. You CAN do it without having to re-do the paint job when you are through, but do you want to risk it? The decorative pavers and succulent-focused landscape design were designed and installed after this main floor master suite addition designed by Arciform Principal Designer Anne De Wolf. Photo by Photo Art Portraits. You won’t want construction equipment and debris rolling over and passing through your brand new concrete driveway or patio. And of course delicate plantings need minimal foot traffic in order to be established properly. So save your exterior landscape and concrete work for the very end. A thoughtful and detailed whole house plan will save you time, money and heartache over the lifetime of your home. Whether you choose to execute your whole vision over a span of a few months or one phase at a time over a decade, your plan will ensure that the end result will be architecturally cohesive, logistically efficient and truly suited to your family’s changing needs over time. Ready to get started on creating your own Whole House Master Plan? Contact restore@arciform.com to schedule your initial design consultation. We look forward to helping you create a vision that will support your home renovation goals for years to come! Want to Review Your Whole House Plan?